For a number of reasons, I’ve recently set up new OpenPGP keys, and will be transitioning away from my old one. I use Thunderbird and the Enigmail OpenPGP extension to encrypt and sign my email communications. Check out the Security in a Box documentation if you wish to do the same. You can read the full statement of transition from this archive which includes details about old/new keys, signatures etc. My personal OpenPGP key has been updated in the contact page. I’ve also advertised this change on social networks I use frequently. If you haven’t done so, I recommended checking out the Riseup OpenPGP best practices documentation. Back in 2009 Logitech introduced the Unifying Receiver, a great way to connect multiple wireless mice and keyboards to one single RF receiver on your PC. The Unifying receiver is uniquely paired to your mice and keyboard. 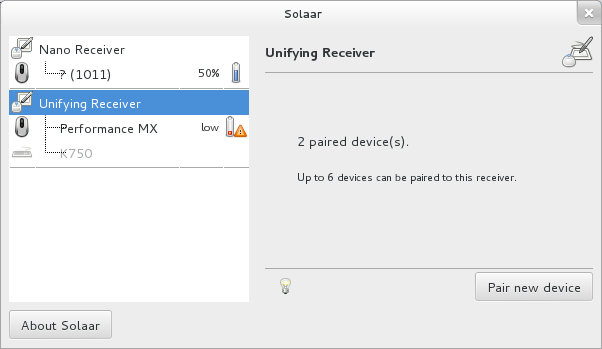 When you buy your devices, they are already paired to the accompanying receiver. They work out of the box on any GNU/Linux system. 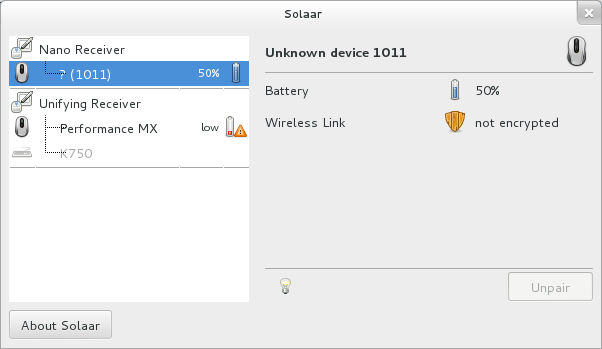 Solaar is a GNU/Linux device manager for Logitech’s Unifying Receiver peripherals. 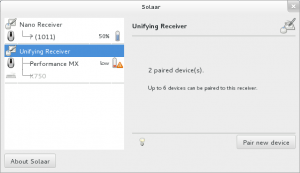 It is able to pair/unpair devices to the receiver, and for most devices read battery status. Wow, it’s been quite some time I hadn’t seen such attention to detail in an application apparently destined to such a « simple » task. 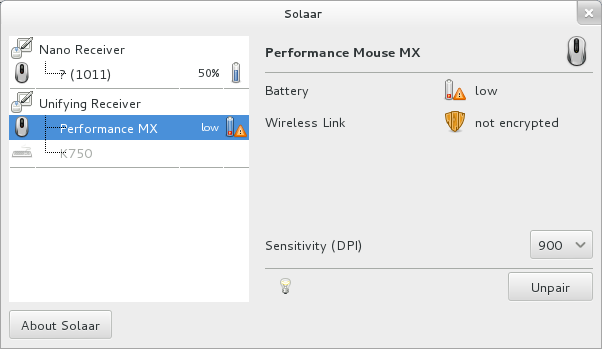 Solaar doesn’t take care of the buttons mapping (yet? ), but I thought I’d throw this extra here. 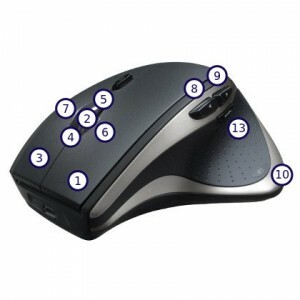 Some time ago I went through the trouble of identifying all the buttons on my mouse and documenting (from Logitech’s accompanying manual) the various expected functions as present in Windows. This is useful for applications where you can specify which button is assigned to an action. Enjoy! As many of you already know by now, Debian 7 is here! I’ve been using Debian as my primary work environment for a few months now and Trisquel at home for the past year and a half or so. My advocacy work has changed as a result, and I stopped focusing on Ubuntu, while still recommending version 12.04 LTS that just works for many. 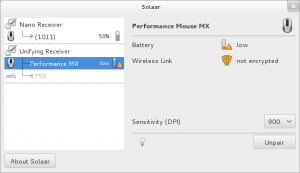 There’s also Ubuntu Gnome (or is it Gnome Ubuntu) now, so there is still a good array of choices for those like me that like the GNOME 3 environment and find it productive. Oh, did I mention Cinnamon 1.8 was just released? I am happy to announce that there is now a Debian Quebec group, and we just got our mailing list approved in the Debian project. This was not as fast an easy as in Ubuntu-land, and I took the time to fully document the process to get the mailing list going, in case others may want to do the same. It may all seem too slow or difficult, but every step of the way several people helped and I learned a lot. 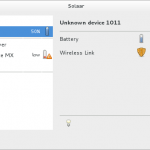 I took this as an opportunity to contribute to the project and at the same time I found that it may be hard for new GNU/Linux users to get started in Debian – or even for experienced ones like me, coming from Ubuntu. That’s why after a few IRC messages I started working on a Welcome to Debian resource (and team) aimed at people that use other distributions and come to Debian for the first time. It’s still very new and incomplete, but it’s what I wished was around when I started dedicating serious time to this distribution a few months ago. As luck would have it, Debian 7 was just around the corner, just a few days/weeks after Ubuntu 13.04 and Trisquel 6 were released. This called for an all-distributions Debian 7 release party (we’ll have two locations, Montreal and Quebec City). There will be workshops and presentations from 12:30 to 5:30 PM and then a happy hour with CLibre and Libre Planet. Check the Agenda du Libre if you’re in Montreal this week (or any time soon), perhaps we can cross paths.